I visited Horizon Lodge in October 2018 and thoroughly enjoyed my stay. You can read more about my time at Horizon and Camp Davidson here. Riders of any ability, from total beginners to more experienced, are welcome at Horizon Lodge. With a herd of 80 guest horses to choose from there really is a horse for everyone. There are a number of knowledgeable guides at the lodge which means they are able to split rides according to ability. This allows for more experienced riders to enjoy faster paced riding and for beginners to grow in confidence. Families are also welcome with some fantastic ponies perfect to give children a wonderful holiday. 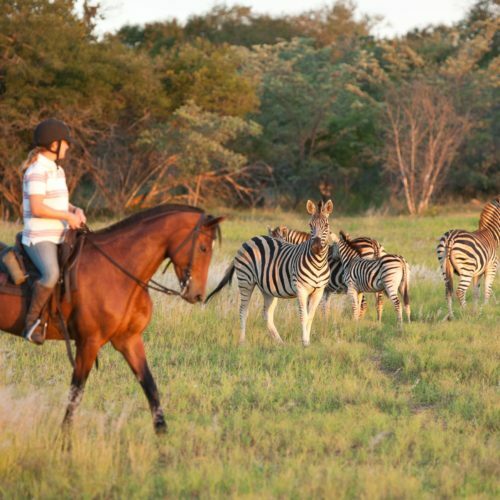 As well as trail riding around the ranch there is also the option to give jumping, polocrosse and western games a try or even to take your horse swimming in the dam (if the hippo are not present). With three hours of riding in the morning, a long lunch siesta and then two hours of riding in the afternoon there is also plenty of time to relax. There is no dangerous game at Horizon but I recommend keeping your eyes peeled for Frank the giraffe as well as herds of zebra and other plains game species as you’re exploring. You may also come across the herd of Horizon horses that are turned out to graze freely across the ranch. It really is wonderful to see the horses free to roam as they please. There are three levels of accommodation at Horizon. The Lakeside Chalets, Garden Chalets and one Standard Room. All of the rooms are comfortable and have been furnished to a high standard with en-suite bathrooms. It is also possible to stay at Camp Davidson, a tented camp, during your stay. This is located higher up on the Horizon Ranch and each tent is nestled amongst sandstone ridges and has its own decking. Made up with wooden framed beds and en-suite bathroom including a bucket shower, this really is glamping and adding a few nights here is a brilliant extra experience during your Horizon stay. I had a wonderful five nights at Horizon but I would have happily stayed longer. This really is a fantastic destination for families, groups and solo travellers. You could stay for a full week or even add a short stay to a longer African adventure. I really couldn’t recommend Horizon more.